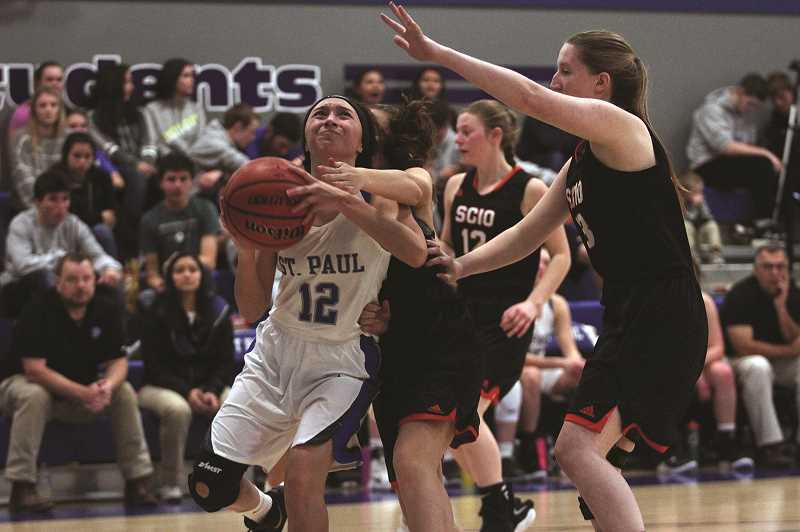 Facing off against a Scio team that has struggled to generate wins and featured five freshmen on the varsity roster, there was little doubt that the St. Paul girls would come away with a victory in their season opener on Nov. 30. But it was how the team won that was important to Bucks head coach Dave Matlock, who needed to see if his players — particularly those coming off the bench — were prepared to play 32 minutes of full court, aggressive basketball for this game and the season to come. After walking away with a 77-13 win, it's safe to say Matlock was satisfied. "I really loved our energy right from the start," Matlock said. "Our defense – we were really clamping them down, and that's the key to our game. If we play defense, it creates a lot off our defense and it gives us a lot of energy to do better on offense, and we saw that tonight." The Bucks followed with a 66-35 win over the Heppner Mustangs on Saturday, giving St. Paul (2-0) a strong start in their reintroduction to 1A basketball after a four-year layoff. Coming into the season, Matlock knew he had all the pieces for a dominant team this year. For three years, the Bucks struggled to break out of the ultra-competitive 2A Tri-River Conference for an elusive playoff berth before finally doing so last year, culminating in a 24-6 season in which St. Paul finished third in the state tournament. After graduating just two players from that team, St. Paul entered this season looking to carry that momentum over into the Casco League. And with All-State juniors Erin Counts and Isabelle Wyss, along with veterans like seniors Emma Conner and Megan Tuck, along with junior Karlee Southerland, the Bucks boast a starting five that can match up with any 1A team in the state. But in the practices leading up to the season opener, Matlock wanted to make sure the Buckaroos were not just the product of their starters, that the frenetic energy with which St. Paul attacks its opponents wouldn't be lost when the second unit entered the game. "They were kind of laying back like Erin, Emma and Bella will take care of it, and that can turn into a mindset and a habit," Matlock said. "I saw that and really chewed on them hard, saying we've got to have 10 players here. We don't have three players. We don't have four players. We have 10 players." The win over Scio removed all doubts. St. Paul's bench mob took Matlock's words to heart, coming out with the same energy as the outgoing starters and putting relentless pressure on the Loggers that resulted in an unusually high 47 free throws. "We were getting a lot more aggressive, as far as basket attacks, than we were last year," Matlock said. "If we can bring this energy, run like that and play defense like that, we're going to be in every game and we're probably going to be the aggressor in most games." Wyss got the ball rolling early, pounding the ball inside to the tune of 12 points in the opening quarter en route to 18 on the night. Counts led both teams in scoring, finishing with 20 points, including three 3-pointers while shooting 7-of-14 from the free throw line. 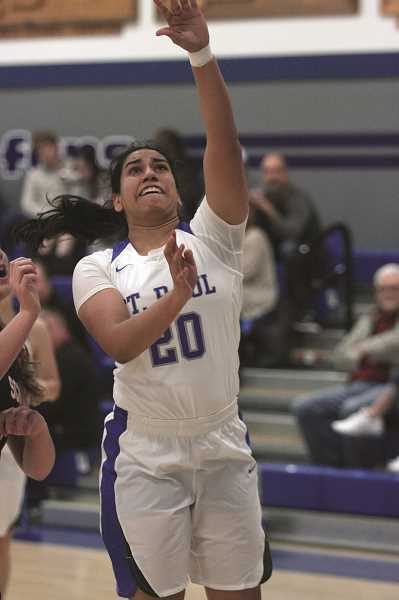 But it was junior reserve Abby Gonzalez who caught Matlock's attention, coming in and providing a steady source of offense in the final three quarters of the game, finishing with 14 points. In total, the Bucks' bench players accounted for 22 points and nine free throw attempts, taking to heart Matlock's concerns heading into the contest. "They really responded to that well," Matlock said. "Girls like Diana (Hernandez) were driving, diving on the floor, attacking. That's huge for us, because we can go to the bench, stay fresh and try to run, and that's the key to our game." While Scio was a team building for the future, the Heppner game was against a seasoned opponent who, like St. Paul, had also reached the 2A quarterfinal tournament last year. Matlock knows the road will only get harder from here on out, with teams like Santiam and Monroe, along with a full slate of difficult league opponents on the horizon. In order to make their way back to the state tournament and vie for a championship, the Bucks will need every ounce of energy in their reserve. You're either going to be chased or you're going to be the chaser, and we want to be the chaser," Matlock said. "If we can bring that energy every night, we're good enough that we can create a lot of havoc for a lot of teams." The Buckaroos open their league schedule this week when they travel to the Livingstone Adventist Academy Lions (0-1) on Thursday, following by a home game against the Santiam Wolverines (2-0) on Friday.